Beaches Turks & Caicos is a multi-faceted fantasy world, where pastel pink bungalows are nestled in tropical gardens resplendent with graceful palms. Here, there are almost enough pools for each day of the week, and the last day is reserved for the largest pool of all, the clear turquoise sea bordered by a 12-mile stretch of beach. 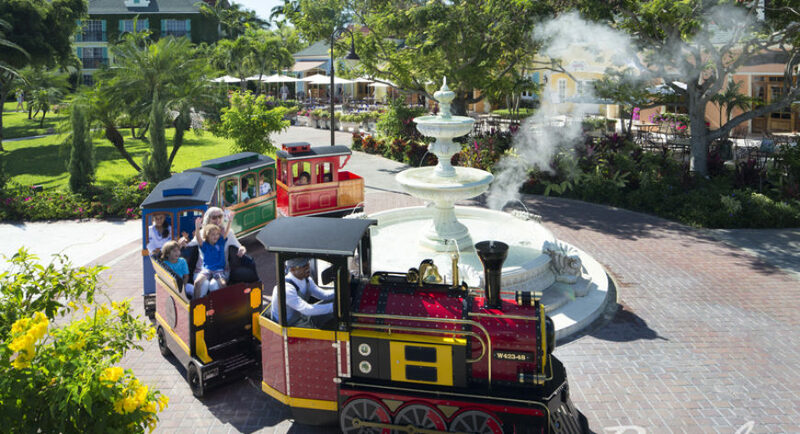 Made up of four distinct areas, Beaches Turks & Caicos offers the seaside garden paradise of the Caribbean Village, the sophisticated style of the French Village, the monumental surroundings of the Italian Village, along with the Key West Village which features 3 & 4 bedroom Villas. Twenty-One (21) specialty dining options, including Room Service for Butler, serviced categories, with everything from the Caribbean to Japanese, Italian to French, Seafood to Sushi. Experience Gourmet Discovery Dining at Beaches. 7000-sq-ft retail village offering guests’ high-end jewelry, fashion, candies, souvenirs. 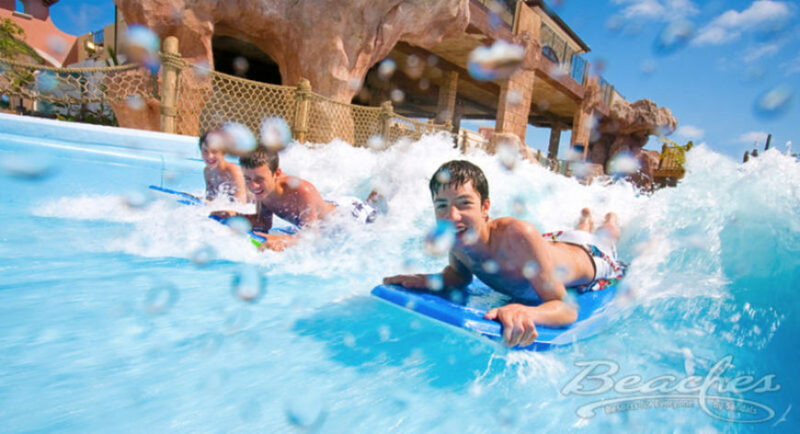 Our very own Pirates Island themed aqua-playground hosting one of the Caribbean’s most comprehensive water parks featuring nine slides, lazy river, surf simulator, water cannons, cranks and spray features. 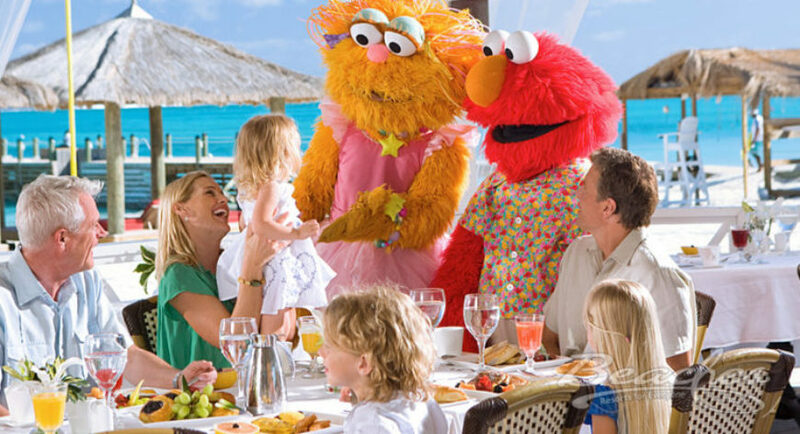 Kids of all ages can enjoy fun and games with Elmo and friends in our Caribbean Adventure with Sesame Street®. 15 minutes away you can visit the world’s only Conch Farm. Explore the fascinating process of farming the Queen Conch, “Strombus Gigas”, from fertilization to harvest. X-BOX® Play Lounge with plasma screens and the latest games on the market. Your wish is our command. With the uncompromising attention to detail of a personal butler trained to the highest standards by the elite Guild of Professional English Butlers, you will be pampered throughout your stay in extraordinary ways. From unpacking and packing your luggage…attending to your wardrobe …serving a glorious meal on your terrace…just to name a few…a Beaches suite, complete with your own personal butler, is the ultimate indulgence. These suites also include a Private Airport Transfer. 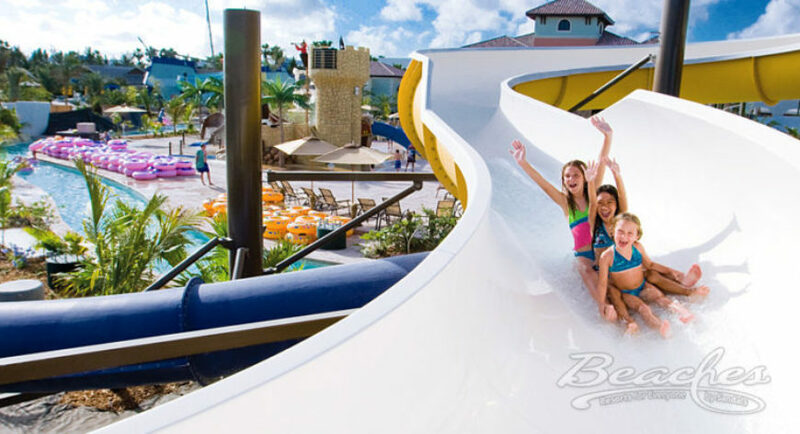 Located in exotic Grace Bay in Providenciales, Turks & Caicos Islands, ranked one of the top ten best scuba diving destinations in the world, Beaches Turks & Caicos Resort Villages & Spa is a Caribbean wonderland of adventure and luxury for kids of all ages. 758 rooms & suites, 43 categories on over 75 acres. Air conditioning, king or double beds, satellite TV, state-of-the-art XBOX360®, refrigerator, hairdryer, telephone, iron & ironing board, safe, clock radio, coffee maker, private bath & shower. All rooms and suites are tiled. Also, we have physically challenged rooms which are equipped with Roll in Shower, rails in the bathroom, extended shower head, beds are lowered, raised toilet seats, and steps (if needed). Opening out directly onto the powdery white-sand beach from its two oversized patios, this suite features a king size mahogany, four poster bed, adorned with a plush duvet, twin daybed with trundle and lounge sleeping chair, 42” flat screen TV plus a bar area with its own refrigerator and microwave. 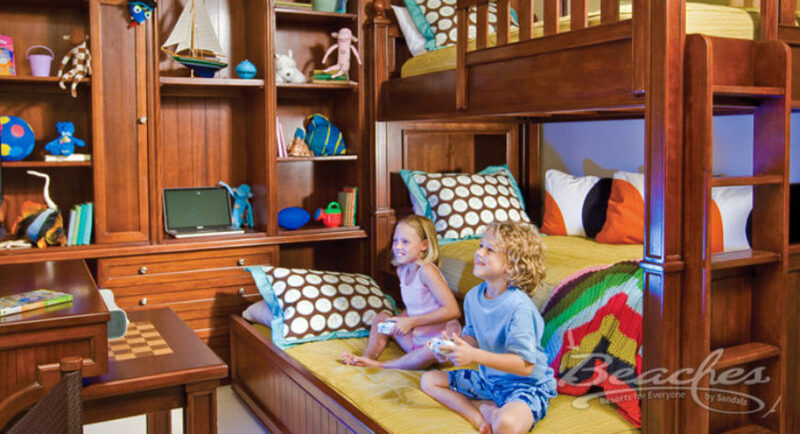 Kids enjoy mahogany bunk beds with a trundle; a 27” flat screen TV with a state-of-the-art XBOX360®; a multi-function game table; a built-in, nautical, mahogany storage wall unit; its own closet; and a vanity unit with basin and mirror. Bathroom hosts a two-basin mahogany vanity with a wall-mount makeup mirror and hair dryer; a whirlpool tub; a separate rainhead shower; and a private water closet. Connecting doors lead into living room with its daybed and trundle, sleeper sofa, cocktail table, lounge chair, desk, 42” flat screen TV, oval dining table with seating for six, wet bar, butler’s pantry with refrigerator and microwave, full closet and bathroom. These accommodations offer Private Airport Transfers. Showcasing a direct, magnificent, panoramic view of the Caribbean Sea, this suite features a king size mahogany, four poster bed, adorned with a plush duvet, twin daybed with trundle and lounge sleeping chair,42” flat screen TV plus a bar area with its own refrigerator and microwave. Kids enjoy mahogany bunk beds with a trundle; a 27” flat screen TV with a state-of-the-art XBOX®; a multi-function game table; a built-in, nautical, mahogany storage wall unit; its own closet; and a vanity unit with basin and mirror. Bathroom hosts a two-basin mahogany vanity with a wall-mount makeup mirror and hair dryer; a whirlpool tub; a separate rain head shower; and a private water closet. Connecting doors lead into living room with its daybed and trundle, sleeper sofa, cocktail table, lounge chair, desk, 42” flat screen TV, oval dining table with seating for six, wet bar, butler’s pantry with refrigerator and microwave, full closet and bathroom. These accommodations offer Private Airport Transfers. Featuring king size mahogany, four poster bed, adorned with a plush duvet, twin daybed with trundle and lounge sleeping chair,42” flat screen TV plus a bar area with its own refrigerator and microwave. Kids enjoy mahogany bunk beds with a trundle; a 27” flat screen TV with a state-of-the-art XBOX®; a multi-function game table; a built-in, nautical, mahogany storage wall unit; its own closet; and a vanity unit with basin and mirror. Bathroom hosts a two-basin mahogany vanity with a wall-mount makeup mirror and hair dryer; a whirlpool tub; a separate rainhead shower; and a private water closet. Connecting doors lead into living room with its daybed and trundle, sleeper sofa, cocktail table, lounge chair, desk, 42” flat screen TV, oval dining table with seating for six, wet bar, butler’s pantry with refrigerator and microwave, full closet and bathroom. These accommodations offer Private Airport Transfers. Featuring king size mahogany, four poster bed, adorned with a plush duvet, lounge sleeping chair.,42” flat screen TV plus a bar area with its own refrigerator and microwave. Kids enjoy mahogany bunk beds with a trundle; a 27” flat screen TV with a state-of-the-art XBOX®; a multi-function game table; a built-in, nautical, mahogany storage wall unit; its own closet; and a vanity unit with basin and mirror. Bathroom hosts a two-basin mahogany vanity with a wall-mount makeup mirror and hair dryer; a whirlpool tub; a separate rainhead shower; and a private water closet. Connecting doors lead into living room with its daybed and trundle, sleeper sofa, cocktail table, lounge chair, desk, 42” flat screen TV, oval dining table with seating for six, wet bar, butler’s pantry with refrigerator and microwave, full closet and bathroom. These accommodations offer Private Airport Transfers. Featuring king size mahogany, four poster bed, adorned with a plush duvet, twin daybed with trundle, 42” flat screen TV plus a bar area with its own refrigerator and microwave. Kids enjoy mahogany bunk beds with a trundle; a 27” flat screen TV with a state-of-the-art XBOX®; a multi-function game table; a built-in, nautical, mahogany storage wall unit; its own closet; and a vanity unit with basin and mirror. Bathroom hosts a two-basin mahogany vanity with a wall-mount makeup mirror and hair dryer; a whirlpool tub; a separate rainhead shower; and a private water closet. Connecting doors lead into living room with its daybed and trundle, sleeper sofa, cocktail table, lounge chair, desk, 42” flat screen TV, oval dining table with seating for six, wet bar, butler’s pantry with refrigerator and microwave, full closet and bathroom. These accommodations offer Private Airport Transfers. Featuring king size mahogany, four poster bed, adorned with a plush duvet, lounge sleeping chair, 42” flat screen TV plus a bar area with its own refrigerator and microwave. Kids enjoy mahogany bunk beds with a trundle; a 27” flat screen TV with a state-of-the-art XBOX®; a multi-function game table; a built-in, nautical, mahogany storage wall unit; its own closet; and a vanity unit with basin and mirror. Bathroom hosts a two-basin mahogany vanity with a wall-mount makeup mirror and hair dryer; a whirlpool tub; a separate rainhead shower; and a private water closet. Connecting doors lead into living room with its daybed and trundle, sleeper sofa, cocktail table, lounge chair, desk, 42” flat screen TV, oval dining table with seating for six, wet bar, butler’s pantry with refrigerator and microwave, full closet and bathroom. Available on a request-only basis, this exclusive suite includes our elite butler service. These accommodations offer Private Airport Transfers. Featuring king size mahogany, four poster bed, adorned with a plush duvet, lounge sleeping chair.,42” flat screen TV plus a bar area with its own refrigerator and microwave. Kids enjoy mahogany bunk beds with a trundle; a 27” flat screen TV with a state-of-the-art XBOX®; a multi-function game table; a built-in, nautical, mahogany storage wall unit; its own closet; and a vanity unit with basin and mirror. Bathroom hosts a two-basin mahogany vanity with a wall-mount makeup mirror and hair dryer; a whirlpool tub; a separate rainhead shower; and a private water closet. Connecting doors lead into living room with its daybed and trundle, sleeper sofa, cocktail table, lounge chair, desk, 42” flat screen TV, oval dining table with seating for six, wet bar, butler’s pantry with refrigerator and microwave, full closet and bathroom. Available on a request-only basis, this exclusive suite includes our elite butler service. These accommodations offer Private Airport Transfers. Opening out directly onto the powdery white-sand beach from its oversized patio, this suite features a king size mahogany, four poster bed, adorned with a plush duvet, twin daybed with trundle and lounge sleeping chair, 42” flat screen TV plus a bar area with its own refrigerator and microwave. Kids enjoy mahogany bunk beds with a trundle; a 27” flat screen TV with a state-of-the-art XBOX®; a multi-function game table; a built-in, nautical, mahogany storage wall unit; its own closet; and a vanity unit with basin and mirror. Bathroom hosts a two-basin mahogany vanity with a wall-mount makeup mirror and hair dryer; a whirlpool tub; a separate rainhead shower; and a private water closet. Showcasing a direct, Ocean view of the Caribbean Sea, this suite features a king size mahogany, four poster bed, adorned with a plush duvet, twin daybed with trundle and lounge sleeping chair, 42” flat screen TV plus a bar area with its own refrigerator and microwave. Kids enjoy mahogany bunk beds with a trundle; a 27” flat screen TV with a state-of-the-art XBOX®; a multi-function game table; a built-in, nautical, mahogany storage wall unit; its own closet; and a vanity unit with basin and mirror. Bathroom hosts a two-basin mahogany vanity with a wall-mount makeup mirror and hair dryer; a whirlpool tub; a separate rainhead shower; and a private water closet. Featuring king size mahogany, four poster bed, adorned with a plush duvet, lounge sleeping chair, 42” flat screen TV plus a bar area with its own refrigerator and microwave. Kids enjoy mahogany bunk beds with a trundle; a 27” flat screen TV with a state-of-the-art XBOX®; a multi-function game table; a built-in, nautical, mahogany storage wall unit; its own closet; and a vanity unit with basin and mirror. Bathroom hosts a two-basin mahogany vanity with a wall-mount makeup mirror and hair dryer; a whirlpool tub; a separate rainhead shower; and a private water closet. Featuring king size mahogany, four poster bed, adorned with a plush duvet, twin daybed with trundle, 42” flat screen TV plus a bar area with its own refrigerator and microwave. Kids enjoy mahogany bunk beds with a trundle; a 27” flat screen TV with a state-of-the-art XBOX®; a multi-function game table; a built-in, nautical, mahogany storage wall unit; its own closet; and a vanity unit with basin and mirror. Bathroom hosts a two-basin mahogany vanity with a wall-mount makeup mirror and hair dryer; a whirlpool tub; a separate rainhead shower; and a private water closet. These suites are centrally located. They are close to the beach, Iguana’s pool and many of the resort’s restaurants. The Master bedroom features a king bed with a roman tub and a separate walk in shower and the second bedroom with double beds has a full bathroom. The living area has a double pullout sofa, flat screen television, kitchenette with microwave and small fridge. There is also a walk in shower. All of these have patios.These accommodations offer Private Airport Transfers. This is a one-of-a-kind one bedroom suite, which features a full living room, formal dining area, full kitchen, bedroom with a king bed. This suite also carries two queen size sofa beds. The master bathroom has a bidet and whirlpool. Crib and/or rollaway bed available. This suite has a large balcony. These accommodations offer Private Airport Transfers. These lavish suites feature mahogany king size beds, Plasma TV and living area with trundle. The suites have one walk in shower with roman tub. All of these suites have either patio or balcony. The entire suite is tiled and the bedrooms features a mahogany four-poster king bed, Plasma TV and a bath with a whirlpool and walk in shower. The parlor has a Trundle Bed. Ground floor suites have a patio and second floor suites a balcony. These suites are tiled and are elegantly appointed with mahogany furnishings featuring king beds and a trundle. Cribs and rollways can be accommodated. Each of these suites has either a patio or Balcony. These exciting rooms feature either a king bed with a Trundle Bed or double beds with a single sleep chair. Both room configurations have Plasma TVs and a large full bath. Cribs and rollaway can be accommodated. All rooms have balconies. A mahogany king bed with a Trundle Bed or mahogany double beds with a single sleep chair. Both types of rooms have Plasma TVs and a large full bath. Cribs and rollaway can be accommodated. All rooms have patios. These rooms are fully tiled and feature either a mahogany king bed with a Trundle Bed or mahogany double beds with a single sleep chair. Both types of rooms have Plasma TVs and a large full bath. Cribs and rollways can be accommodated. All rooms have balconies. Beaches Resorts create culinary experiences that take one on a global journey of delectable discovery. With numerous distinctive types of cuisine, one can discover sumptuous regional specialties, with each one delivering a new cultural flavor. Shorts or jeans, t-shirts or polo shirts. Swimwear must be covered. Shirts and footwear required. Sress pants/trousers or jeans for men, long or short sleeved dress shirts (with or without collar). Dress shoes or elegant sandals. No shorts, t-shirts, sleeveless shirts or sneakers. This Tex-Mex Cantina features a waterfall cascading into one of the Caribbean’s largest swimming pools; non-smoking. This restaurant serves a southwestern buffet for lunch and Tex-Mex a la carte for dinner, with indoor & outdoor seating. Open for Breakfast, Lunch and Dinner, served a la carte without door seating. Feast on delicious international specialties at breakfast, lunch and dinner in this charming, open-air restaurant overlooking the scintillating ocean in the distance beyond. A 1950’s style diner serving all the diner favorites including hamburgers, hotdogs, pizza, macaroni cheese, fries and sandwiches. Healthy options include wraps, pita sandwiches and a variety of salads and fresh fruits. Air conditioned. A quaint French Café serving a wide assortment of French pastries, crepes and sandwiches, gourmet coffees and teas. Indoor Air conditioned and outdoor seating. Come down to Treasure Beach and enjoy the flavorful delights of true Jamaican Jerk Chicken & Pork, Beer & Rum! This Piazza features a traditional wood-fired pizza oven, serving different varieties of hand-tossed pizza. Next to the pizzeria, guests have their own Grill, where they can help themselves to burgers, hot dogs, sandwiches and ice cream throughout the day. Outdoor seating. Savor traditional Italian cuisine in a quaint Resort setting. Breakfast, Lunch & Dinner served buffet style with made to order items; non-smoking. This restaurant offers air conditioned indoor and outdoor seating. This distinct restaurant features exotic teppanyaki-style dishes prepared at the table. This restaurant is air-conditioned and non-smoking. An authentic French Restaurant where you are served fine European cuisine and some traditional French specialties. This Restaurant is a la Carte and offers indoor air-conditioned and Patio dining. This Restaurant is open for those 12 years and up only. A Tuscan-inspired open kitchen where guests choose from delicious offerings (served buffet-style for breakfast and lunch and a typical a la Carte Italian menu for dinner) in a brick walled, decorative ironwork and vaulted ceiling atmosphere. The restaurant also features a special Medieval-themed children’s section where kids can dine amongst their favorite pals from Sesame Street. Indoor air conditioned and outdoor seating. Neptune’s evokes images of Neptune casting his trident upon the waters to conjure the freshest fish and seafood from the abyss. An al fresco, seaside setting, low lights, skies brimming with stars and the gentle murmur of the waves mingle with the aromas and tastes of Seafood Tagine and Tuna Niçoise to convey the experience of dining at an elegant but casual seaside bistro on the Amalfi Coast. Simple, flavorful, seafood in an unparalleled seaside setting. This restaurant features International cuisine (served buffet style) air conditioned indoors or outdoors or in a tropical setting. Continental cuisine served with classic, white-gloved elegance. This a la carte restaurant offers indoor air conditioned or outdoor dining. This is an Adults only restaurant. Savor fresh gourmet seafood along with a sensational view of Grace Bay Beach. A la Carte Breakfast and Dinner, with indoor air conditioned and outdoor seating available. Dinner-only, open air restaurant serving sushi and sashimi specialties. Authentic pub fare, served in a lively setting, for lunch and dinner. Indoor air conditioned or outdoor seating. A late night weekly Chocolate Extravaganza serving an assortment of handmade chocolate delights and martinis. Weekly all guests are invited to the Beach party to enjoy the live music, the BBQ and bar set up with bonfires and entertainment for all. Let the warmth of the islands soothe your soul. Discover a completely unique mind & body experience that transforms you – inside & out. Take the time to let us envelop you in natural botanicals & you will feel renewed for a lifetime. Your journey begins with a Red Lane Rejuvenation Specialist who is dedicated to creating an incomparable experience with a focus on CONNECTION, TIME and LOVE. Whether it’s the perfect setting for your spa experience or your favorite tropical infused aroma, we will adapt our treatments to your personal preferences. Exercise in a group! Rather than jump on a machine, get your workout by moving to the beat of your favorite songs. CERTIFIED and dedicated Fitness Professionals will lead you through a workout of a variety of movement combinations that exercise your muscles while you have fun in the sun at the same time. Our up-to-date classes are not intimidating and persons of ALL ages and fitness levels will enjoy our classes.